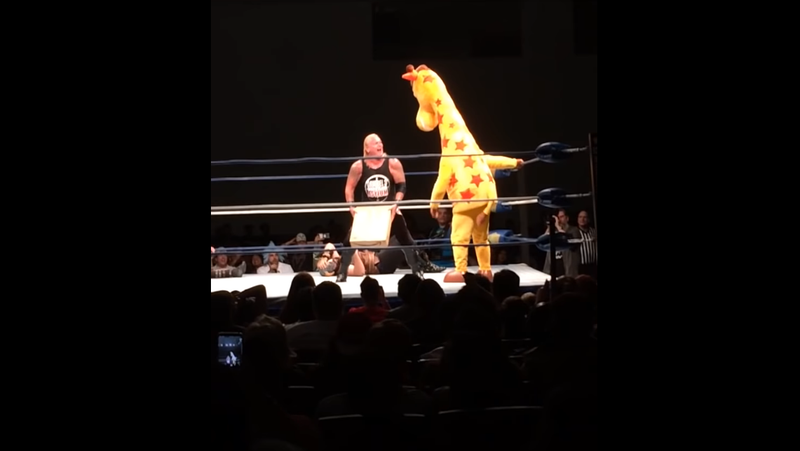 Geoffrey the Giraffe, venerable mascot of the now-defunct Toys “R” Us retail chain, was doing pretty good for himself at the Florida Supercon’s FCSW 30-man wrestling rumble on Friday—until, like in real life, he was cold-clocked with an Amazon Prime delivery box and stumbled unconsciously out of the ring. While Amazon was not the primary cause of Toys “R” Us’ downfall—that would be the private equity firms that bought the brand in a leveraged buyout and saddled it with huge amounts of debt—competition from huge e-commerce firms like Amazon or big box stores like Target and Walmart didn’t help. Though the toy chain’s revenue held relatively steady before and after the Great Recession, per the Atlantic, its massive, multi-billion debt load left it with little room to innovate and survive. In any case, now that Toys “R” Us has liquidated all of its inventory (one person alone reportedly bought $1 million in discounted toys for the needy), Amazon is more than happy to seize the opportunity to carve up what is left of Geoffrey’s market. Recent reports suggest it may be planning on circulating its own holiday toy catalog to millions of Amazon users, replacing Toys “R” Us’ famed version. Is the Toys"R"Us Lego mark-up ripping us off?